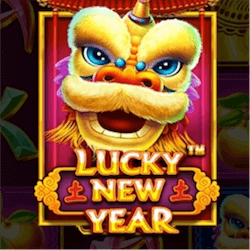 Recent pokies like Lion Dance, Dragon Dance, Year of the Rooster and Lucky Dragons have all been titles themed around Chinese festivals. While fans originally enjoyed these titles, many recent efforts form developers have been quite plain and don’t offer many new features or reel icons. Lucky New Years is no exception to this rule unfortunately. It features familiar location and familiars symbols. While there are few surprises here, Pragmatic Play has still created a reliable and enjoyable game, the question is just how can they hope to compete on the market with anything less than excellent? The 25 available paylines here take wagers starting at 0.01 all the way up to wagers of 125. The medium variance here offers a 96% RTP and there is also a progressive jackpot feature. While these are all good features to include, it is still clear that Lucky New Year delivers just below expectations even on its good points. A gold dog icon is the substitute symbol which will replace any symbol required to finish a match if it is in a winning payline. The Scatter symbol on the other hand gives players access to the Free Spins feature but doesn’t offer any payouts. As with the design elements of this game, while the inclusion of a scatter and a wild symbol is welcome, their limited use is not ideal. The Scatter symbol for example will also only appear on reels 1, 3 and 5. The free spin round changes up the reels a bit. The middle three reels will all meld into a single giant symbol while reels 1 and 5 spin freely. You can retrigger more free spins with the scatter icon here. This is a potentially rewarding feature which could have been better if more spins were won when triggering the bonus. The Lucky Lanterns icons are special symbols that can award players with the cash value shown on the front of their faces, but they are also the trigger icons for the progressive jackpot feature. You need to fill up the reels during the randomly activated Lucky Lanterns feature, with lucky lantern symbols to win the jackpot.